Hi Ville, thanks for taking the time to do this interview for our German webzine Metal1.info. How are you doing some days before Christmas? Do you like the holidays or does it mean much stress for you? Hello to you too, I’m here just drinking my morning coffee on the 23rd of December and feeling fine. Most of my „christmas“ (I hate to use that word, sorry) shoppings are still undone so I have to get to that soon I guess. The good thing about this holiday is the time with your family, but all that commercial santa-claus-presents-for-me stuff is plain rubbish. People have forgot why they were celebrating this time of the year in the first place (hint: nothing to do with jesus christ). Does Yule or Christmas have a special meaning for you? I partly answered this in the previous question, but to clarify it, yes it does. I celebrate it as the day of the return of the sun, according to the pagan tradition of the winter solstice (though the winter solstice is actually a couple of day before the 24th). I also value the serenity surrounding these few days (between 24th and 26th the whole country seems to be closed) and the time I can have with my family and friends. How do you prefer to spend the last night of the year? Loads of beer and party or more in an easy round with friends or family? New year’s eve is a traditional drinking day, and we usually go to some friend’s place to celebrate it. We buy beer (more than we need so it won’t run out!) and some firecrackers to shoot at midnight, then listen to music and drink the whole night with our close friends. It’s probably the most insane party during the whole year. Could you imagine of giving a concert on December, 31th around 10pm? Many people like to attend to a musical event with partying next to the musicians into the New Year. If we had an offer, why not? Everyone’s out during the new year’s eve anyway, so we could probably also get our share of the audience. I still prefer staying with my close friends on these few days when I actually can. Lets move on to the music. Your new album „V: Hävitetty“ will be out on January 19th here in Germany. Are you satisfied and happy with it? Hah, I am ultimately satisfied and happy. It took me several listens to actually get into the album (even though I was in the studio making it! ), but now I consider it to be the damn best album we have done so far. Seriously. How are the first reactions on the album? I think it is a true masterpiece and the best Moonsorrow-album until now. Thanks! So far I’ve heard only extremely positive response, I don’t know if it is because the album is actually good, or because the reviewers don’t understand it and just give full points because 2 songs over 56 minutes just has to be so epic it has to be good. Seriously though, check the German magazines, I’ve been overwhelmed. I would say, „V“ is your most complexe and progressive album and contains elements from all your former cds like the black metal parts from „Verisäkeet“ or the more tranquil and bombastic parts from „Kivenkantaja“ but anyway has its very own sound in your discography. Do you agree on that? I do, actually. We didn’t really think of combining any elements from our previous albums as such, but incorporating many different approaches into these two songs resulted to also having lots of references to our previous albums – in addition to lots of references to totally different sources. I think it has the most variety of our albums definitely. Was it planned from the first to make two epic longtracks or have you realized during the songwriting process that this material cannot work as short tracks? We didn’t plan anything before we started writing the music. And as we say – „the song is ready when it’s ready“ – it often happens that we have 10 minutes of material and the songs still seems to be needing something. The songs just kept stretching and stretching, and in the end we realised we are having these two massive tracks. And because they both have their musical structure very carefully thought, they definitely couldn’t work as shorter tracks. Can you imagine to do shorter and more simple and party suitable tracks like your older songs or would that be nothing else than a step back at this moment? We can’t imagine doing it now, but as with every previous album, we always had a different approach. I can’t see doing our first album again, but we are also not doing this one again. We’ll see what happens when we start to write new material, stay tuned. Some people may think that the songs are too long and they will miss some catchy moments. That’s their loss, not mine. I can understand that there are people who just don’t get this kind of music, but we haven’t directed our music to them. We want (and have always wanted) to reach the people who can actually listen to music – let go of the world for a moment and concentrate – and we want to offer them some enjoyable moments with us. After all, we are those people as well. The next logical step on looking at your development would be an album with only one epic song. Somewhere i read that if you would record a one-song-cd this would be the last Moonsorrow album. Still up to date? What we have publicly said holds. And because we are not ready to quit this band just yet, I don’t think we are going to make that one-track album next. It will most probably be, as always, „something completely different“. The artwork is a really beautiful picture. What did you tell the artist about how it should look like? Did it become the picture you had in mind? For me personally it reminds me of The Lord Of The Rings and Mordor with the motive and this gloomy atmosphere. Do you consider yourself still as a Viking or Pagan Metal band? In comparison to the most other bands of this genre meanwhile you make much more complex and less happy music. To be a pagan metal band only means you have to be pagan and play metal, it doesn’t really define your „musical style“. I know that most bands in the same category make different music, but this is the direction we have wanted to take, and I see us being much closer to for example Primordial than any bands in this „folk metal“ trend. We are pagan metal, definitely, 100%. What is your opinion on the Pagan / Viking scene? There is still a boom in this genre; in Germany it is really extreme at the moment. I think the scene is getting better by now, but there are still too many „folk metal“ bands who play the same cheap medieval melodies over and over in different scales. And by too many I mean too many to interest me. 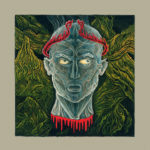 It is highly supportable that people start to discover their roots (the ideological side of pagan metal), but they could try and be more innovative with their music (the musical side of pagan metal) to stand out. In days as Quorthon died you were often named as legitimate successor of Bathory. In my „V“-Review I wrote „Quorthon founded the pagan metal genre and Moonsorrow perfected it“. Praise or ridiculous? Ridiculous praise. :) As a great fan of Bathory (and not only the viking stuff) I have to be greatly honoured if anyone says stuff like that about Moonsorrow. I mean it is ridiculous, but if we have done something to achieve that, I’m proud to be part of it. You have presented „V“ for the first time ever in Hamburg via a Listening Session. Why in Germany and not in Finnland? It was the idea of our German promotion company Sure Shot. You know we don’t decide about these business things ourselves, and to be honest, we don’t even care. It is the label’s job to sell the music, and if they see a prelistening session as a fitting way for promotion, by all means! There will be public listening sessions in Finland also in the beginning of January, anyway. The only thing that matters to us here is that we can play the official album release show in our home town of Helsinki (January 27th). Are you planning to play a song of the new album live? I think it must be very hard to play 30 minute song without a break and hard for the listeners too, especially those who haven’t heard the new material. We have now rehearsed a slightly edited version of other one of the songs (I’m not telling you which just yet), so it won’t be a complete half an hour. It will definitely be long though, and definitely the most challenging live number we have ever done. We are still rehearsing though and don’t know exactly how it will turn out in the end. It can be very weird for people who haven’t heard the album to hear the song live and wonder when is it going to end, but well, we play it through and after it they can decide if they liked it or not – if they didn’t get bored and leave, that is. For the second time in a row you will headline Germany’s first pagan metal festival Ragnarök 4 in March 2007. How are your expectations on that gig and how remains the Ragnarök 3 gig in your mind? In our forums nearly everyone yells „Fock ye, Moonsorrow is coming, I love it, now I have to come“, it seems that your popularity grows year by year in Germany. I remember Ragnarök 3 very well, it was the biggest show we had on our European tour, great show for lots of insane German people and we are most definitely looking forward to return. People in Germany seem to like Finnish in music in general, and I’m glad we’re on the list because it’s always fun to play there. Stay tuned not only for Ragnarök 4 but also our upcoming European tour with several German dates (details to be published later), we will ravage the place! You will also play at Wacken and Summer Breeze, what do you expect from this two big festivals? Do you prefer more to play on pagan/black/folk festivals with 3000 fans waiting for Moonsorow or big festivals with more people who could perhaps discover you? Wacken and Summer Breeze will definitely be big thrills because they are by far the biggest festivals we’ve played. I’m looking forward to see how it turns out. We prefer to play for anyone who wants to see us, so it doesn’t matter if it’s a small club gig or a big festival as long as we’re awaited there, and it doesn’t matter if the people have already seen us or not as long as they’re enjoying. The ideal show is a combination of our fans and new people. You will be on the road in Canada for some gigs in January. Viking and Pagan Metal may not be the biggest names in the North American area. Do you think there are many people who like this music? Is there a potential to build a scene? Last year you already played in North America so maybe you know a bit about the area. I know for a fact that there are many people in North America who are into pagan metal, but the actual musical scene on that continent doesn’t seem to favour that. Amon Amarth touring there now might get the pagan metal scene a bit more unified though and encourage people to come to shows in bigger numbers. There is potential to build a scene for sure. We had 500-600 people in Minneapolis, US and 200-300 in Montreal, Canada last year so it was far above what we expected. I’m definitely looking forward to going over again. It would be great to have a dvd with a full live show (I didn’t really like the previous one), but the problem is that we would both have to have a show that is so good we want to release it, and shoot it with professional high-end cameras and sound. We don’t want to do anything half-made but go all the way, and doing stuff like that is expensive. What does the internet mean to you? How do you use it? I have used the internet on a daily basis for many years, and couldn’t really imagine working without it anymore (can anyone?). I do a lot of work with music, not only playing, and the easiest way to get to information and to people is through the internet and email. Yeah yeah, it has its problems with illegal downloading and all that stuff, but there isn’t much I can do about it. 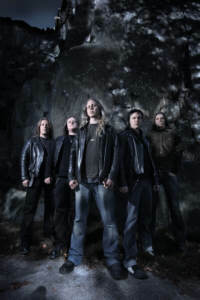 Last time I interviewed Moonsorrow in early 2005 Mitja told the story of Henri and the sausage in the disco. Can you top that with an even more funny happening? Hmm, I don’t know if I can top it with this, but mentioning the names of Henri and Mitja reminded me of Mitja’s weird fascination with fire extinquishers (once again). We were sitting in the hotel room in Kemi (though calling that a hotel is an insult towards all hotels) and Henri was smoking a cigarette. Henri waved his hand and accidentally the curtain caught fire – well, it wasn’t actually even burning but there were only a few sparks that kept spreading in a very very low speed. What Mitja did is that he ran out of the room, returned with a fire extinquisher and blasted the whole thing on the few sparks! The stuff from the fire extinquisher absorbed all the oxygen in the room so everyone had to run out coughing, and the room was totally white from the dust even next morning and no one could sleep there. That’s what happens when you take Mitja anywhere, give him a few beers and a fire extinquisher. Try to avoid that! Sentenced: Utmost respect from me to the way they ended the band. No comebacks, no reunions, and a great last album! 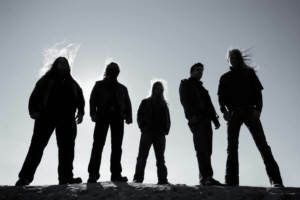 Amon Amarth: I had the chance of meeting them on a few occassions, cool people. They just might make it big in America, so thumbs up! Manowar: The undisputed kings of metal, and the real life Spinal Tap. Classical Music: A great source of inspiration. A few masterpieces and a great load of crap, just as with any other music. Stephen King: Read some of his books, very inspirational stuff. Unfortunately all the movies made out of Stephen King’s works are crap – except The Shining that is a brilliantly awesome masterpiece. Black Jack and hookers: Now you got me puzzled. Black Jack is cool, especially useful for losing money. Never tried hookers. br>Webzines: I prefer printed ones because you can take them with you to the toilet, but when I’m sitting on the computer and working, I often read some interesting interviews and other stuff from webzines. Metal1.info: Wish I could understand it, but my German is so rusty! Ville, thank you very much for answering our questions. I wish you all the best with the album and the upcoming tourdates, I’m looking forward to see you at Ragnarök again. Thanks for the interview, and I wish you and your website all the best in the future! See you on tour! Schon Anfang 2005 beglückten uns MOONSORROW mit einem neuen Album, „Verisäkeet“ begeisterte damals wie heute. Ziemlich genau zwei Jahre später steht mit dem fünften Album der Finnen, „Viides Luku – Hävitetty“, ein Bombastwerk epischer Größe an. In 56 Minuten und zwei Liedern nehmen sie den Hörer gefangen und fesseln mit großartigem Ohren-Erlebniskino. Frontmann Ville Sorvali klärt über die Entstehung, die Bedeutung und die Zukunft mit diesem ambitioniertem Werk auf. Hi Ville, danke dass du dir die Zeit nimmst, dieses Interview für unser Webzine Metal1.info zu beantworten. Wie geht es dir in den Tagen vor Weihnachten? Magst du die Feiertage oder bedeuten sie Stress für dich? Hallo auch dir, ich sitze hier am Morgen des 23. Dezember, trinken meinen Morgenkaffee und fühle mich gut. Die meisten meiner „Weihnachts“- (ich hasse es, dieses Wort zu benutzen, sorry) Einkäufe hab ich noch nicht erledigt, ich sollte das also besser bald mal machen. Das gute an den Feiertagen ist die Zeit mit der Familie, der ganze kommerzielle Santa-Claus-Geschenke-für-mich Kram ist einfach nur Müll. Die Menschen haben vergessen, warum sie diese Zeit des Jahres ursprünglich eigentlich gefeiert haben (Hinweis: Das hat nichts mit Jesus Christus zu tun). Hat Weihnachten oder das Julfest für dich eine besondere Bedeutung? Teilweise hab ich das ja eben schon beantwortet, aber um das zu klären, ja, hat es. Ich feiere es als den Tag der Rückkehr der Sonne, aufgrund der heidnischen Tradition der Wintersonnenwende (obwohl das schon ein paar Tage vor dem 24. ist). Ich schätze auch die Stille, die diese Tage umgiebt (zwischen dem 24. und 26. Dezember scheint das ganze Land geschlossen zu sein) und die Zeit, die ich mit meiner Familie und meinen Freunden verbringen kann. Wie wirst du die letzte Nacht des Jahres verbringen? Literweise Bier und Party oder eine kleinere Runde mit Familie und Freunden? Silvester ist ein traditioneller Trinktag und in der Regel gehen wir zu einigen Freunden und feiern dann zusammen. Wir kaufen Bier (mehr als wir brauchen, damit es uns nicht ausgeht!) und einige Feuerwerkskörper und lassen die um Mitternacht los, danach hören wir Musik und trinken die ganze Nacht mit unseren besten Freunden. Das dürfte die verrückteste Party des ganzen Jahres sein. Kannst du dir vorstellen, am 31. Dezember um 22 Uhr ein Konzert zu geben? Viele mögen es, an Silvester auf ein Konzert zu gehen und zusammen mit den Musikern das neue Jahr zu begrüßen. Wenn wir ein Angebot bekommen, warum nicht? In der Silvesternacht ist jeder unterwegs, da könnten wir sicher auch einen Teil der Leute abgreifen. Ich bevorzuge es aber trotzdem, diese paar Tage mit den engsten Freunden zu feiern, sofern es möglich ist. Lass uns nun zur Musik kommen. Euer neues Album „V: Hävitetty“ erscheint in Deutschland am 19. Januar. Bist du zufrieden und glücklich damit? Hah, ich bin total zufrieden und glücklich damit. Ich habe einige Durchgänge gebraucht, bis ich ins Album gefunden habe (obwohl ich selbst im Studio war und es gemacht habe! ), nun aber halte ich es für das verdammt nochmal beste Album, das wir je gemacht haben! Ganz ehrlich. Wie sind die ersten Reaktionen auf das Album? Ich finde, es ist ein wahres Meisterwerk und auch, dass es das bisher beste Moonsorrow-Album ist. Danke! Bisher hab ich nur extrem positive Reaktionen bekommen. Ich weiß nicht, ob es daran liegt dass das Album tatsächlich gut ist oder die Reviewer es nicht verstehen und einfach die volle Punktzahl geben, weil zwei Lieder in über 56 Minuten sowas von episch sind, dass es einfach gut sein muss. Nun aber ernsthaft, schau dir die deutschen Magazine an, ich bin überwältigt. Ich würde sagen, “ V“ ist euer komplexestes und progressivstes Album und beinhaltet Elemente aus allen eueren bisherigen Werken, wie etwa die Black Metal-Parts von „Verisäkeet“ oder die mehr ruhigeren und bombastischen Elemente von „Kivenkantaja“, hat aber ebenso seinen sehr eigenen Sound in euerer Discografie. Stimmst du mir zu? Das tue ich tatsächlich. Wir haben nicht darüber nachgedacht, irgendwelche Elemente unserer vorherigen Alben auf diese Weise zu kombinieren, aber durch das Zusammenfügen der ganzen Elemente in diesen beiden Songs hat dazu geführt, dass es eben auch viele Referenzen der bisherigen Alben gibt – genau so wie Referenzen zu völlig unterschiedlichen Quellen. Ich finde, es definitiv unser bisher vielfältigstes Album. War es von Anfang an geplant, zwei epische Longtracks zu schreiben oder habt ihr während dem Songwriting gemerkt, dass das Material nicht in kurzen Stücken funktionieren kann? Wir planen gar nichts, bevor wir nicht damit angefangen haben, die Musik zu schreiben. Wir sagen immer „Der Song ist fertig, wenn er fertig ist“, und so passiert es oft, dass wir 10 Minuten Material haben, die Lieder aber irgendwie immer noch etwas brauchen. Die Songs haben sich immer weiter und weiter gestreckt und am Ende haben wir realisiert, dass wir diese beiden massiven Stücke haben. Und weil die musikalische Struktur von beiden sehr sorgfältig durchdacht ist, könnten sie auf keinen Fall in kürzeren Versionen funktionieren. Kannst du dir vorstellen, in Zukunft wieder simplere und partytauglichere Lieder wie euere älteren zu schreiben oder wäre das zum jetzigen Zeitpunkt nichts anderes als ein Schritt zurück? Wir können uns das im Moment nicht vorstellen, aber so war es auch mit jedem unserer bisherigen Alben, wir haben immer einen anderen Anspruch. Ich kann mir nicht vorstellen, unser erstes Album nochmal zu machen, genau so aber werden wir dieses hier nicht wiederholen. Wir werden sehen was dabei rauskommt, wenn wir wieder neues Material schreiben. Das ist deren Problem, nicht meins. Ich kann schon verstehen, dass es Leute gibt, die mit solcher Musik einfach nichts anfangen können, aber wir haben unsere Musik auch nicht nach ihnen ausgerichtet. Wir wollen und wollten immer die Leute erreichen, die der Musik tatsächlich zuhören können – die Welt für einen Moment verlassen und sich konzentrieren – und wir wollen ihnen einige angenehme Momente mit uns bieten. Schließlich sind auch wir solche Leute. Mit einem Blick auf euere Entwicklung wäre ein Album mit nur einem epischen Song der nächste logische Schritt. Irgendwo las ich mal, dass ihr, wenn ihr ein Ein-Song-Album aufnehmen würdet, es das letzte Moonsorrow-Album sein wird. Steht das immer noch? Was wir öffentlich sagen, halte wir auch ein. Und da wir noch nicht bereit sind, die Band aufzulösen, denke ich nicht, dass wir als nächstes ein Ein-Song-Album machen werden. Es wird wohl, wie immer, „etwas völlig anderes“. Das Artwork ist ein wirklich wundervolles Bild. Welche Vorgaben habt ihr dem Künstler gemacht? Wurde es das Bild, dass ihr euch vorgestellt habt? Mich persönlich erinnert es mit dem Motiv und der düsteren Atmosphäre an den Herrn der Ringe und Mordor. Siehst du euch selbst noch als Viking oder Pagan Metal Band? Im Vergleich mit vielen anderen Bands des Genres macht ihr inzwsichen weit komplexere und weniger fröhliche Musik. Eine Pagan Metal Band zu sein bedeutet nur, dass du heidnisch sein musst und Metal spielst, es beschreibt nicht wirklich deinen „musikalischen Stil“. Ich weiß, dass die meisten Bands in der gleichen Kategorie unterschiedliche Musik machen, aber das ist die Richtung, die wir nehmen wollten. Ich sehe uns auch viel mehr in der Nähe von zum Beispiel Primordial als allen anderen Band dieses „Folk Metal“-Trends. Wir sind Pagan Metal, definitiv, 100%. Wie siehst du die Pagan / Viking Szene? Das Genre boomt immernoch, in Deutschland ist es momentan wirklich extrem. Ich denke, die Szene bessert sich im Moment, es gibt aber noch viel zu viele „Folk Metal“ Bands, die alle die gleichen billigen mittelalterlichen Melodien immer und immer wieder in verschiedenen Tonlagen spielen. Und mit zu viel meine ich zu viel um für mich interessant zu sein. Es ist sehr unterstützenswert, dass die Leute anfangen, ihre Wurzeln zu entdecken (die ideologische Seite des Pagan Metal), aber sie sollten versuchen, ihre Musik innovativer zu gestalten (die musikalische Seite des Pagan Metal), um aus der Masse herauszustechen. In den Tagen, als Quorthon starb, wurdet ihr oft als legitime Nachfolger von Bathory genannt. In meiner „V“-Review habe ich geschrieben „Quorthon hat das Genre ins Leben gerufen, MOONSORROW haben es perfektioniert…“. Lob oder lächerlich? Lächerliches Lob :) Als großer Fan von Bathory, und nicht nur dem Viking-Zeug, muss ich mich äusserst geehrt fühlen, wenn jemand sowas über Moonsorrow sagt. Ich meine, es ist lächerlich, aber wenn wir etwas getan haben, um das zu erreichen, bin ich stolz ein Teil davon zu sein. Ihr habt „V“ zum ersten mal überhaupt in Hamburg mit einer Listening Session präsentiert. Warum in Deutschland und nicht in Finnland? Das war die Idee unserer deutschen Produktionsfirma Sure Shot. Weißt du, wir entscheiden diese Businesssachen nicht selbst, und um ganz ehrlich zu sein, kümmert uns das gar nicht. Ist ist der Job des Labels, die Musik zu verkaufen und wenn sie finden, dass eine Prelistening-Session ein passender Weg für die Promotion ist… Mit allen Mitteln! Es wird Anfang Januar übrigens auch in Finnland öffentliche Listening Sessions geben. Das einzige, das uns wirklich wichtig ist, ist dass wir die offizielle Albumveröffentlichungsshow in unserer Heimatstadt Helsinki am 27. Januar spielen können. Plant ihr, einen Song des neuen Albums live zu spielen? Ich denke, es dürfte sehr hart sein, 30 Minuten lang ohne Pause zu spielen und für die Hörer dürfte es ebenfalls hart sein, vor allem für die, die das neue Material noch nicht gehört haben. Wir haben eine leicht bearbeitete Version eines Songs geprobt (ich sage dir aber noch nicht, von welchem), es wird also nicht ganz eine halbe Stunde werden. Es wird aber natürlich trotzdem lang sein und zweifellos die herausforderndste Nummer, die wir je live gespielt haben. Wir feilen aber immer noch daran und wissen noch nicht ganz genau, wie es am Ende werden wird. Für Leute, die das Album vorher noch nicht gehört haben, könnte das ziemlich seltsam werden den Song live zu hören und sich zu wundern, wann er zu Ende sein wird. Aber gut, wir spielen es durch und danach können sie entscheiden, ob sie es mögen oder nicht – das heisst, wenn sie sich nicht langweilen und einfach gehen. Zum zweiten mal hintereinander werdet ihr Deutschlands erstes Pagan Metal Festival, das Ragnarök 4 im märz 2007, headlinen. Was erwartest du davon und wie hast du das Ragnarök 3 in Erinnerung? In unseren Foren freut sich nahezu jeder, dass ihr nochmal kommt, es scheint als würde euere Popularität in Deutschland Jahr für jahr zunehmen. Ich erinnere mich sehr gut ans Ragnarök 3, es war die größte Show auf unserer Europatour, eine großartige Show für viele verrückte Deutsche und wir freuen uns auf jeden Fall darauf, wieder zu kommen. Die Leute in Deutschland scheinen finnische Musik im allgemeinen zu mögen und ich bin froh, auf der Liste zu stehen, weil es immer Spaß macht, dort aufzutreten. Denkt aber nicht nur an das Ragnarök 4 sondern auch an unsere kommende Europatournee mit einigen deutschen Terminen (Details gibt es später), wir werden alles verwüsten! Ihr spielt auch in Wacken und beim Summer Breeze, was erwartest du von diesen beiden großen Festivals? Bevorzugt ihr es, eher Pagan/Black/Folk Festivals mit 3000 Besuchern zu spielen, die alle auf euch warten oder lieber große Festivals mit mehr Menschen, die euch möglicherweise erst noch kennenlernen? Wacken und Summer Breeze werden auf jeden Fall eine geile Sache, weil es bei weitem die größten Festivals sind, die wir dann gespielt haben. Ich freu mich schon wirklich darauf zu sehen, wie das werden wird. Wir bevorzugen es, für jeden zu spielen der uns sehen will, es ist also egal ob es ein kleiner Clubgig oder ein großes Festival ist, solange wir dort erwartet werden. Es ist auch nicht wichtig, ob die Leute uns schon mal gesehen haben oder nicht, solange es ihnen gefällt. Die ideale Show ist eine Mischung aus unseren Fans und neuen Hörern. Im Januar seid ihr für einige Konzerte in Kanada unterwegs. Viking und Pagan Metal dürfte in Nordarmerika keinen allzu riesigen Bekanntheitsgrad haben, aber denkst du dass es dort viele Leute gibt, die die Musik mögen? Gibt es dort Potential für eine Szene? Letztes Jahr habt ihr ja in Nordamerika gespielt, vielleicht weißt du deswegen ja ein wenig was über diese Gegend. Ganz sicher weiß ich, dass es in Nordamerika viele gibt, die Pagan Metal mögen, es scheint aber nicht in die wirkliche Musikszene auf diesem Kontinent zu passen. Amon Amarth touren gerade dort und könnten die Pagan Metal Szene ein wenig mehr zusammenschweißen und die Menschen dazu animieren, in größeren Zahlen zu den Konzerten zu erscheinen. Das Potential für eine Szene gibt es da auf jeden Fall. Wir hatten 500-600 Besucher in Minneapolis (USA) und 200-300 in Montreal (Kanada) im letzten Jahr, es war also viel mehr, als wir erwartet hatten. Ich freue mich auch schon, wieder dort zu sein. Es wäre großartig, eine DVD mit einer kompletten Liveshow zu haben, die vorherige mag ich nicht besonders. Das Problem aber ist, dass wir sowohl eine gute Show haben, die wir alle veröffentlichen wollen und diese dann auch mit professionellen High-End-Kameras und -Sound aufnehmen können. Wir wollen nichts halbgares machen, sondern dann gleich richtig, aber das ist eben teuer. Was bedeutet dir das Internet? Wie benutzt du es? llen, ohne es zu arbeiten. Kann das überhaupt jemand? Ich arbeite viel mit Musik, ich spiele sie nicht nur, und der einfachste Weg, Informationen zu bekommen und Leute zu erreichen sind eben das Internet und E-Mails. Jaja, es hat seine Probleme mit illegalen Downloads und das alles, aber dagegen kann ich halt nicht viel tun. Das letzte mal, als ich Moonsorrow Anfang 2005 interviewt habe, hat mir Mitja die Story von Henri und der Wurst in der Disco erzählt. Kannst du das mit einem noch lustigeren Ereignis toppen? Hmm, ich weiß nicht ob ich das damit toppen kann, aber da du die Namen Henri und Mitja erwähnt, erinnert mich das an Mitjas seltsame Faszination für Feuerlöscher (mal wieder). Wir saßen im Hotelzimmer in Kemi (obwohl, das ein Hotel zu nennen ist eine Beleidigung für alle Hotels) und Henri hat eine Zigarette geraucht. Henri hat mit seiner Hand gewunken und der Vorhang fing dabei Feuer. Nun, es hat nicht wirklich gebrannt, da waren nur ein paar Funken, die sich sehr sehr langsam ausgebreitet haben. Mitja rannte gleich aus dem Zimmer raus und kam mit einem Feuerlöscher zurück und hat das ganze Ding auf die paar Funken entleert! Das Zeug vom Feuerlöscher hat den ganzen Sauerstoff im Raum in sich aufgesogen, so dass wir alle hustend raus mussten. Das Zimmer war sogar am nächsten Morgen noch total weiß vom ganzen Staub und niemand konnte da drin schlafen. Das passiert, wenn du Mitja irgendwo hin mitnimmst, ihm ein paar Bier und einen Feuerlöscher gibst. Versuch das zu vermeiden! Sentenced: Mein größter Respekt geht an sie, wie sie die Band beendet haben. Keine Comebacks, keine Reunions und ein großartiges letztes Album! Amon Amarth: Ich konnte sie an einigen Orten treffen, coole Leute. Sie könnten in Amerika eine große Nummer werden, also Daumen nach oben! Manowar: Die unbestrittenen Könige des Metal und die real life Spinal Tap. Klassische Musik: Eine große Inspirationsquelle. Es gibt ein paar Meisterwerke und ganz viel Schrott, wie es eben bei jeder anderen Musik auch ist. Stephen King: Ich hab ein paar seiner Bücher gelesen, sehr inspirierender Stoff. Leider sind alle Filme, die aus Stephen Kings Werken entstanden sind Müll – ausser The Shining, das ist ein brillantes und überwältigendes Meisterwerk. Black Jack and hookers: Jetzt hast du mich verwirrt. Black Jack ist cool, vor allem gut um Geld zu verlieren. Prostituierte hab ich nie probiert. Webzines: Ich bevorzuge Printmagazine, weil man sie mit aufs Klo nehmen kann, wenn ich aber am Computer sitze und arbeite lese ich oft einige interessante Interviews und sonstiges Zeug von den Webzines. Metal1.info: Ich wünschte ich könnte es verstehen, aber mein deutsch ist so eingerostet! Ville, danke dir vielmals für deine Antworten. Ich wünsche euch alles gute mit dem neuen Album und den kommenden Konzerten, ich freu mich schon darauf, euch beim Ragnarök wiederzusehen. Danke für das Interview, ich wünsche dir und deinem Webzine alles gute für die Zukunft. Wir sehen uns auf Tour!